Become one of the country’s best fitness models with the help of our certified trainers! If you’re looking for more information on how to become one of the best fitness models out there, then it’s important to understand from the get-go that your focus needs to be on hard work, quality training and solid services from providers that can guarantee proven results. Those who are seriously interested in the best fitness model opportunities need to apply that same level of dedication into their everyday fitness routine. That means enlisting the aid of certified, seasoned professionals that are fully capable of helping you reach your goals. You only get one body and one life, so make the most of it! If you want to wow the crowds successfully, you’ve got to get a dedicated personal trainer who’s willing to push you to the limits and bring out the best in you. 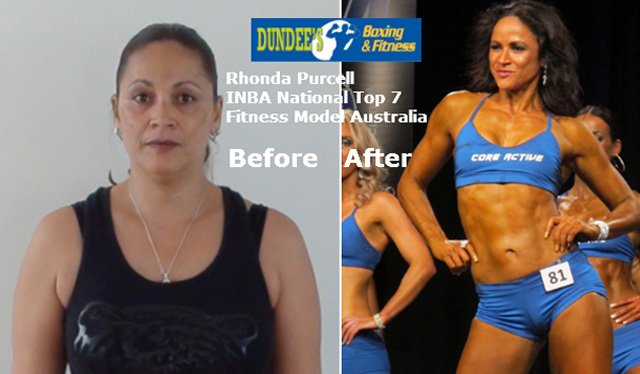 Our trainers have helped countless others compete in fitness modelling competitions such as the INBA. We can train you up from start (training, routine, diet, mental attitude, etc. ), all the way to finish (how to pose on stage, what to wear, etc.). We’ve trained numerous people to compete both in Australia and worldwide (check out some of the videos and stories below!). No matter where you are in life, virtually anyone can become a fitness model. All you need is the right coaching and the drive to go the hard yards to sculpt your body and make an impact on stage. Watch Amy’s fitness model transformation after only 23 weeks. We’ve helped develop some of the best fitness models in Brisbane with tough, proven, supplement-free methods and fantastic results. They’ve achieved medals in fitness model competitions both locally and nationally. Watch uni student Chrissy completely transform herself within a few months of solid fitness model training. Kate, mother of three, joined Dundee’s Boxing and Fitness to compete in INBA 2013 – she looked amazing! Here at Dundee Boxing & Fitness, we provide the serious foundation aspiring fitness models who want to win in a competition or compete for fun. You’ll have access to our full-scale dedication to professionalism and our provision of quality services right here in our boxing and fitness gym in West End (with boxing and fitness gyms soon to open in Yeronga and Bowen Hills. Enjoy an opportunity to work one-on-one with seasoned professional trainers – each one of whom is 100% encouraging and friendly to boot. Get into the best shape of your life while having the time of your life.